To achieve these objectives requires addressing a host of issues, from gender parity and ageing demographics to skills development and global warming. Agriculture sectors have to become more productive by adopting efficient business models and forging public-private partnerships. And they need to become sustainable by addressing greenhouse gas emissions, water use and waste. The risks: malnutrition, hunger and even conflict. Why is food security such a major global challenge? The obvious reason is that everybody needs food. But the complexity of delivering sufficient food to a national population and to the whole world’s population shows why food security is such a priority for all countries, whether developing or developed. In short, this is a global challenge because it’s not just about food and feeding people but also about practically all aspects of an economy and society. 1. Population growth – this varies considerably across countries. 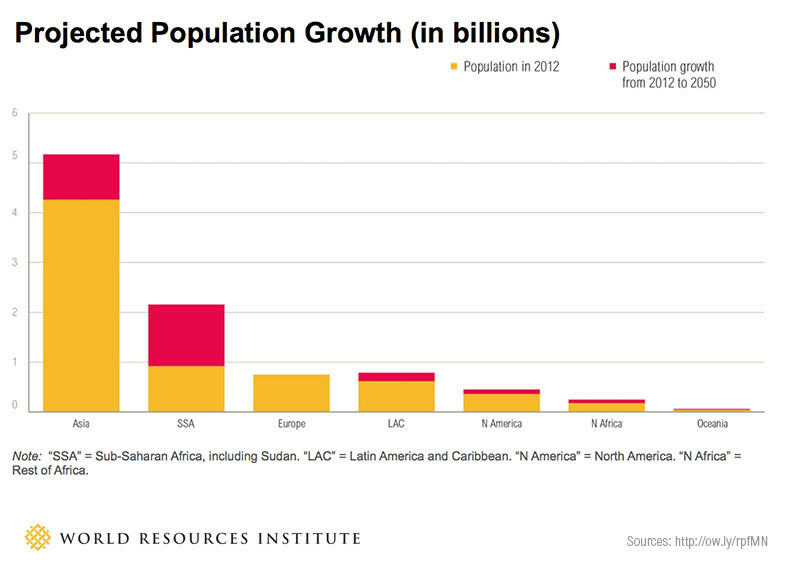 Africa is expected to double its population from 1 to 2 billion by 2050. Populations in the developing world are also becoming increasingly urbanized, with 2.5 billion additional urban residents projected in Africa and Asia. 2. Changing tastes – not only is the population growing, but its diet is changing too. As people become more affluent they start eating food that is richer in processed foods, meat and dairy. 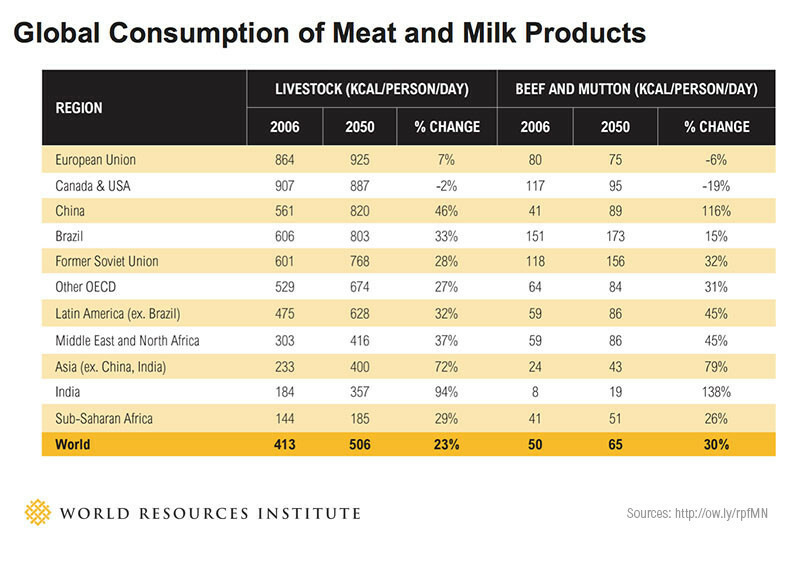 But to produce more meat means growing more grain. 3. Climate change – currently, 40% of the world’s landmass is arid, and rising temperatures will turn yet more of it into desert. At current rates, the amount of food we’re growing today will feed only half of the population by 2050. 4. Water scarcity – this is another impending crisis: 28% of agriculture lies in water-stressed regions. It takes roughly 1,500 litres of water to produce a kilogram of wheat, and about 16,000 litres to produce a kilogram of beef. 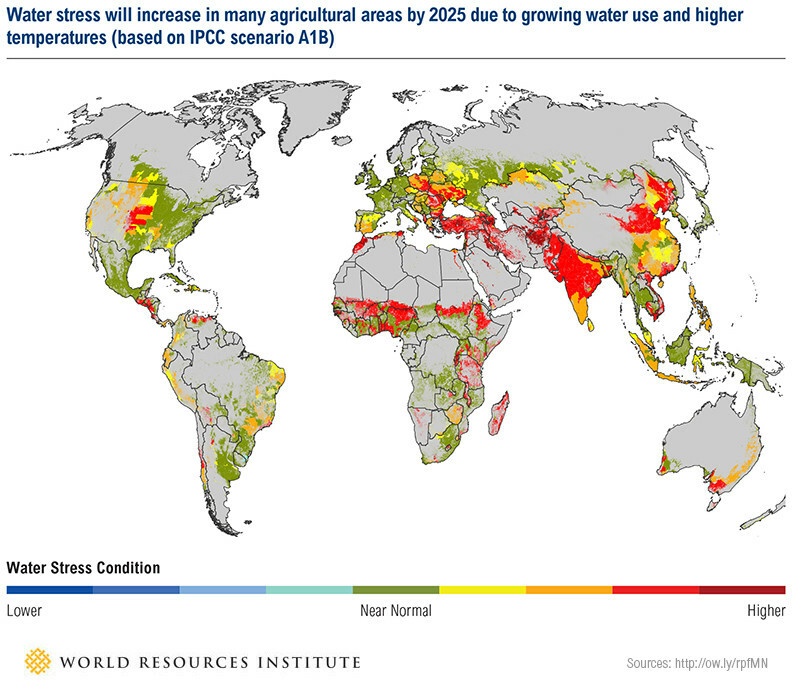 In 2050, we’ll need twice as much water. 5. Troubled farmers – in developed countries, less than 2% of people grow crops or breed animals for food. Fewer and fewer people are choosing farming as an occupation. Meanwhile, food prices are rising, arable land continues to be lost to sprawl and soil is being degraded by over-farming. 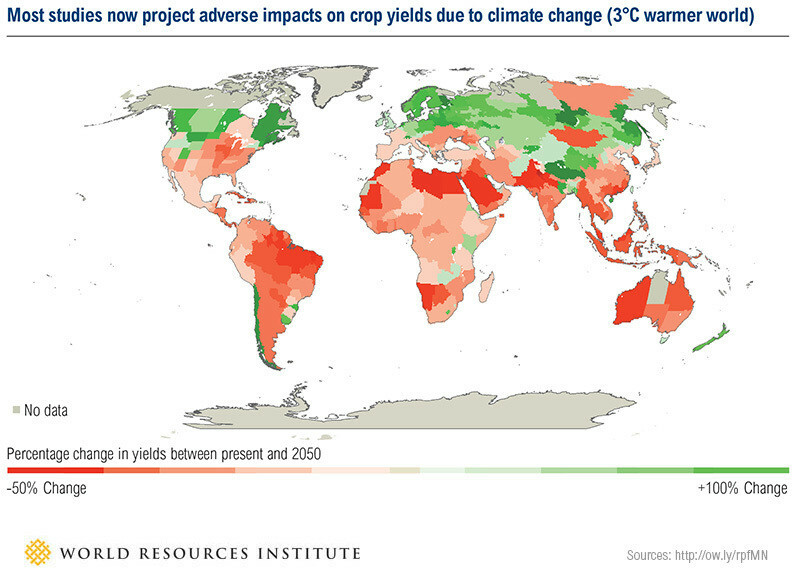 What makes ensuring food security so complex? Consider India. Agriculture accounts for 18% of the economy’s output and 47% of its workforce. India is the second biggest producer of fruits and vegetables in the world. Yet according to the Food and Agriculture Organization (FAO) of the United Nations, some 194 million Indians are undernourished, the largest number of hungry people in any single country. An estimated 15.2% of the population of India are too malnourished to lead a normal life. A third of the world’s malnourished children live in India. Addressing the problem of hunger and malnourishment in an economy such as India’s requires improvements in the productivity of the agriculture sector, particularly smallholder farms. Rural and farming communities typically experience a higher incidence of poverty and hunger. Agriculture must also be sustainable. The sector accounts for 30% of greenhouse gas emissions and 70% of freshwater withdrawals so attention has to be paid to energy and water use is farming. 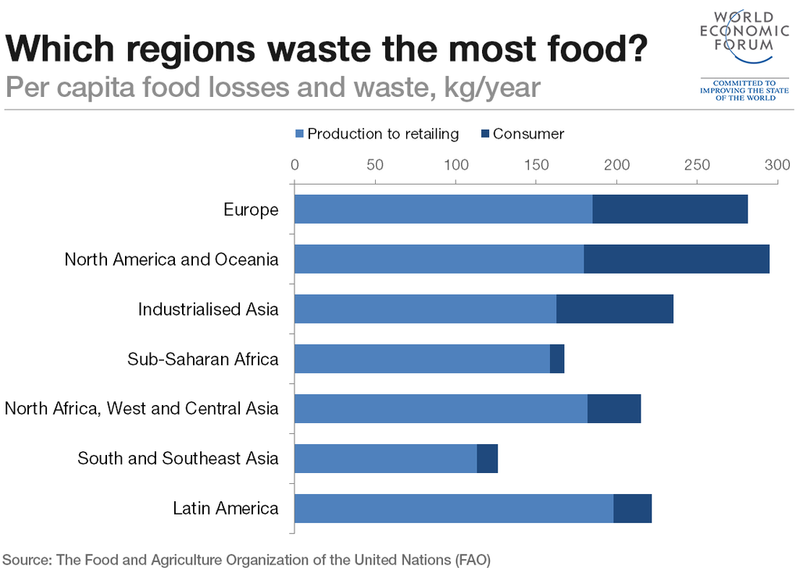 Waste is also a problem, with an estimated one third of food consumption, some $750 billion in value, lost. What’s the World Economic Forum doing about it? In 2007 and into the first half of 2008, global food prices increased sharply stirring social unrest and riots in both developing and developed economies, from Bangladesh to Brazil, from Mexico to Mozambique. This prompted the World Economic Forum and its partners, members and other constituents to define in 2009 a New Vision for Agriculture (NVA) to achieve through market-based public-private approaches 20% improvement in food security, environmental sustainability and economic opportunities every decade till 2050. The World Economic Forum’s action portfolio of locally driven public-private partnerships under the NVA has mobilized over $10 billion, with some $1.2 billion already implemented, reaching nearly 9 million smallholder farmers. Altogether the Forum has launched five targeted initiatives, which aim to bring together farmers, government, civil society and the private sector, facilitating partnerships at regional and country levels, and encouraging the exchange of knowledge.